In front, from left, are Clay Pequignot and Rowyn Adair. In the back row are Joey Korenstra, Kaylee Vanover, Cameron Smith, Katie Yoder and JJ Coronado. 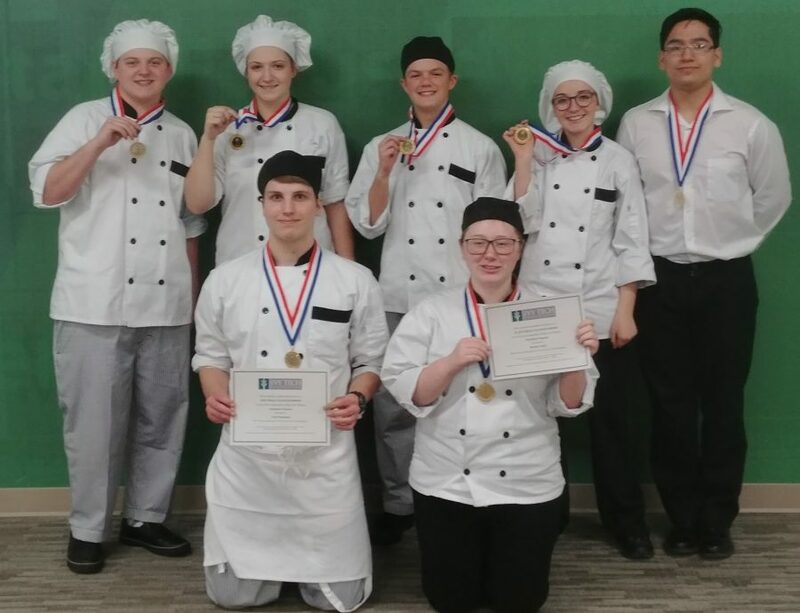 FORT WAYNE — During this past weekend culinary arts students participated in the SkillsUSA regional competition in Fort Wayne. Seven students have qualified to compete at the state competition in April. Students competed against six other career centers and had to be in the top five in order to advance to state. Pathways (Wawasee) Culinary Arts has students from four different schools: Wawasee, Fairfield, West Noble and Columbia City. There were 22 total students competing in culinary, 17 in baking and seven in restaurant service at Ivy Tech, Fort Wayne, Saturday, Feb. 9. Each category may only advance five students. All four who competed in culinary advanced, two of the three in commercial baking and one out of one in restaurant service. In total, seven of 15 students advanced from the region. Winners in culinary were Kaylee Vanover (Wawasee), Joey Korenstra (Fairfield), Clay Pequignot (Columbia City) and Cameron Smith (Columbia City). Winner in commercial baking were Katie Yoder (Wawasee) and Rowyn Adair (West Noble). Winner in restaurant service was JJ Coronado (Wawasee). Clay Pequignot took first place in culinary and Rowyn Adair took first place in commercial baking.